I love holidays and birthdays and celebrations of all sorts, to organize parties and dinners and decorations and cakes for others. I feel that everyone should have a cake on their birthday and should be made to feel special for at least a few minutes. 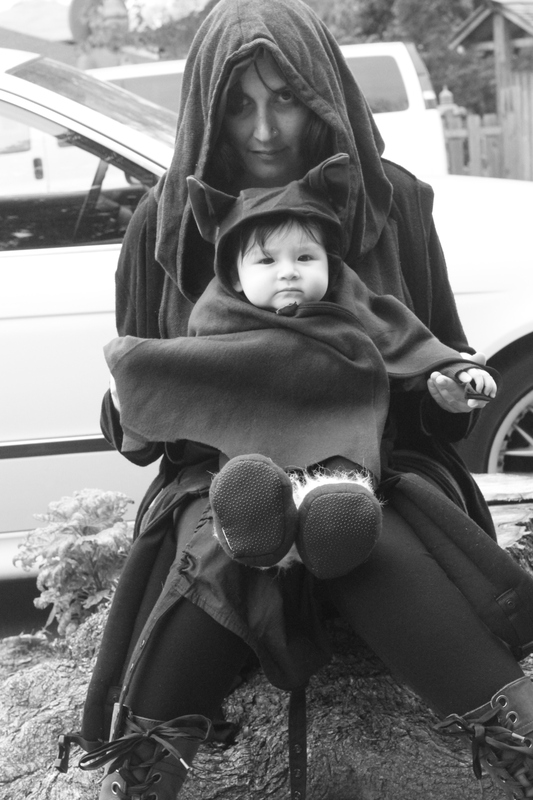 I love all the traditions that my parents started with us and that I hope to continue with my daughter. I love that over the years I have adopted French traditions and holidays and US traditions and holidays, and now, thanks to my boyfriend, Mexican traditions and holidays. Last year when I was in California I learnt more of the Dia de los Muertos (Day of the Dead) traditions and really wanted to make sure that we celebrated them too. Halloween is one of my favourite holidays (nothing surprising there), and I feel this is an awesome way to extend the holiday by a few days with the celebration. The Dia de los Muertos (Day of the Dead) tradition can be traced back thousands of years, to the indigenous people of the area that is Mexico today. 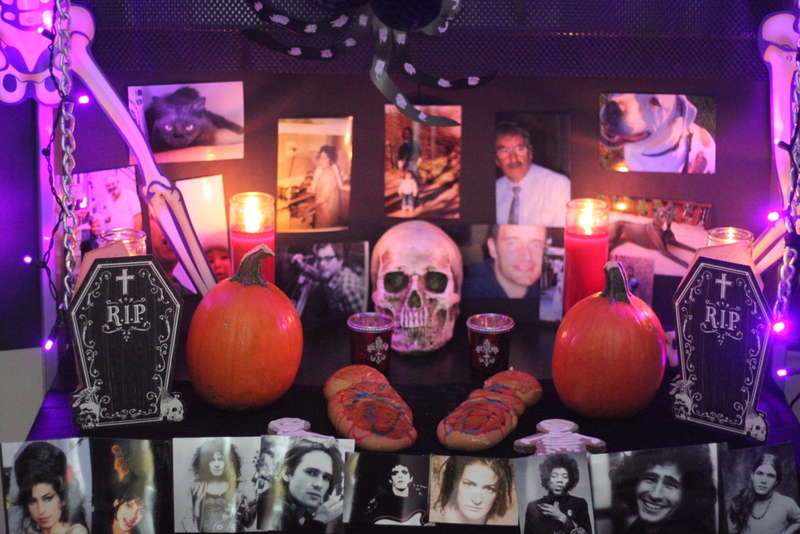 Although it may have more modern religious connotations today it is really mainly a tradition where one celebrates the dearly departed over the days of October 31st, November 1st and November 2nd. 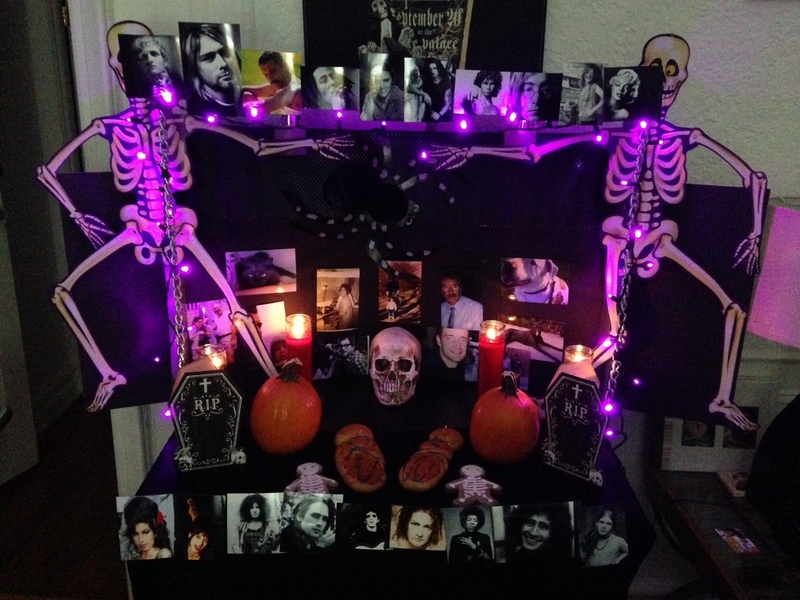 People usually create an altar with photos of dead family members and friends, with candles, offerings, skulls, sugar skulls, flowers, poems or stories, pan de muerto (special bread made for the occasion) and anything else that may be relevant to the people they are celebrating. Traditions differ from family to family, region to region; some people use the day to clean the graves of their beloved, others remember them in different fashions. 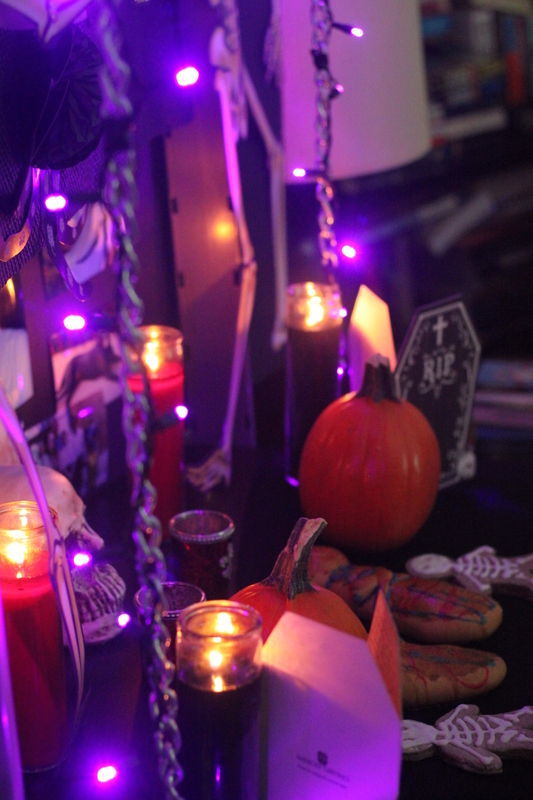 We decided to create our own altar at home and will probably build on it every year. 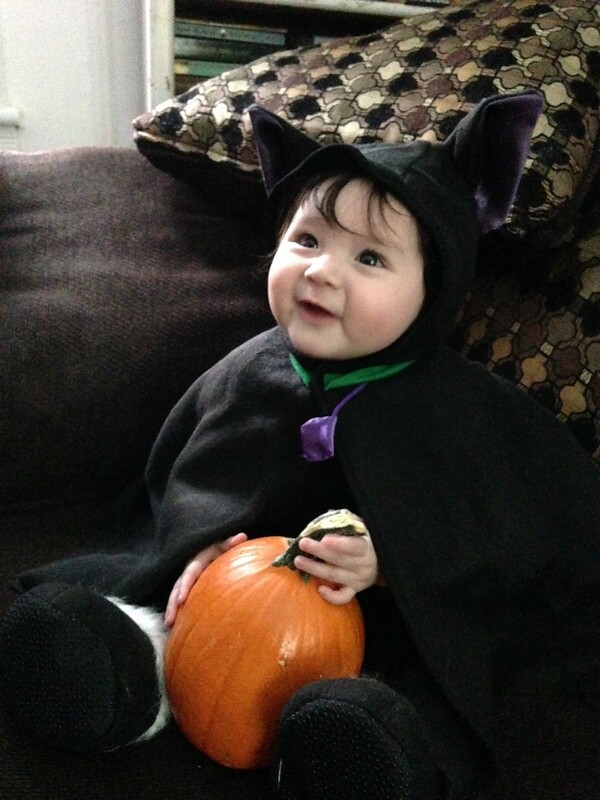 We dressed Luna in her adorable little vampire bat costume for Halloween this year and spent a while taking cute pictures of her trying to maul a pumpkin. 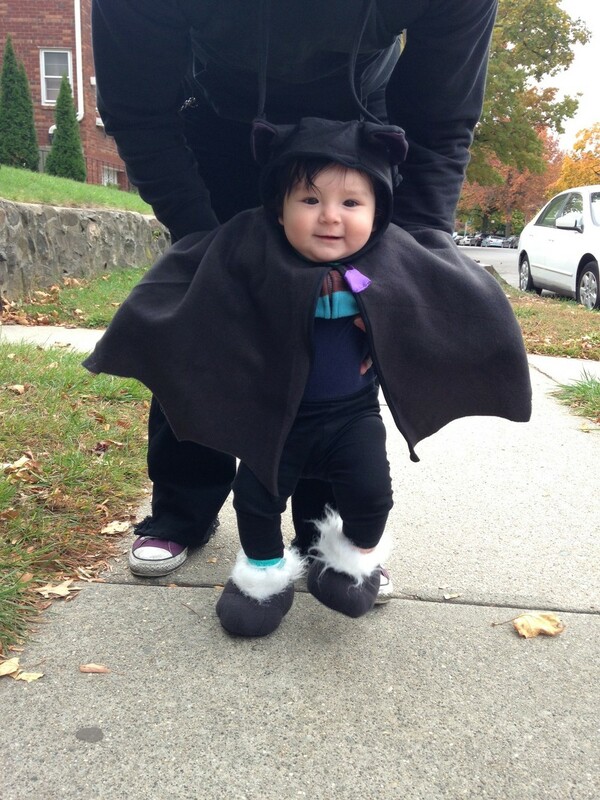 No trick or treating as she can’t eat candy yet, let alone walk, so I really don’t see the point. I have enough candy at home anyway! 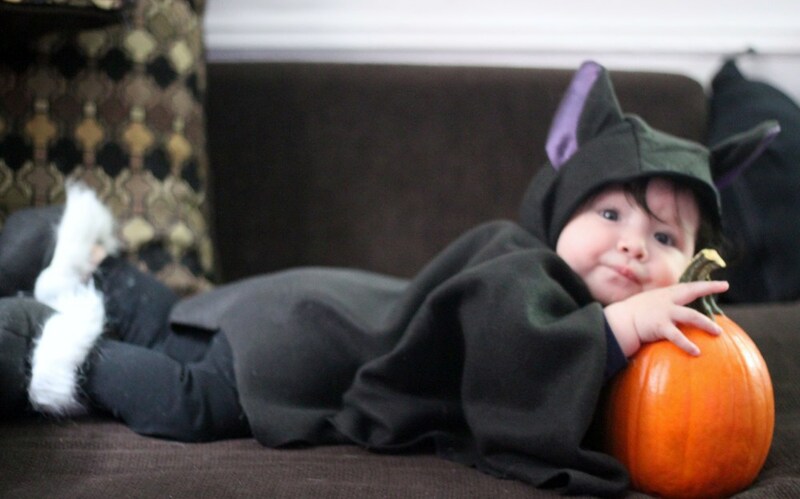 We already have an awesome costume idea for next year when she will hopefully be on her feet and be able to talk a little and actually say “trick or treat”. We took some photos outside after lunch, and then after Cesar went off to work, I spent the late afternoon and evening watching The Addams Family and Beetlejuice, and dancing to the Rocky Horror Picture Show with Luna. Actually sounds like an average day or evening in the Castro-Hughes household to be honest… Maybe next year I will have to do the opposite and play movies like Mary Poppins and Annie, just to be contrary. And we could dress up all in pastel pink and white and listen to happy pop music… Sounds a little torturous, but could be fun. So many ideas! You are our fathers, our grandfathers, our grandmothers, our aunts, our uncles, our dogs, our cats and our friends. All gone too soon from our lives, because never is not an option in life. We love you and think of you often, even after years and years have gone by. There will always be the memories, the photos, the good times and the bad times. The first steps and the last steps, the mountains and the valleys. The cities and the villages, the desert and the ocean. England, France, Mexico, California, NYC. The words, the thoughts, the barks, the meows, the hugs, the kisses, the love that is everlasting. Rest in peace our friends and family members and beloved pets. You are always with us, your spirit lives on in all of us and all around us. Some of you comforted us in our childhood, during our tumultuous teenage years, on into adulthood. Others appeared earlier, or later, but all of you left us with a firm stamp on our hearts and a lasting impression in our brains. You sang us to sleep, you appeared in our dreams, you helped us through our tears, you made us dance all night and you always made sure we never felt alone. You still do all of that. You may not be on this earth anymore, but you are in our hearts and we will pass your music and your words on to our children, and our children will pass them on to their children, just like our parents passed your creations (at least some of them) on to us. Music lives on forever and without the music you left us with we wouldn’t have all of the memories it helped create today. Rest in peace Tim, Jeff, Kurt, Janis, Freddie, Peter, Mia, Lou, Marc and all of you who have left us with sounds that shape our lives.